Traveling via plane can be exciting because it means you are going to far places. It is a chance to see new places, taste new food, and experience new things. But before reaching your destination, you need to go be at the airport 3 or 4 hours before the flight, whether domestic or international flight. After checking-in, the waiting game begins. It takes a lot of patience to wait at the boarding gate especially if you have kids in tow. The free wifi is limited and sometimes has a weak signal because there are a lot of people who are connected. You’ll get hungry and thirsty and you have no choice but to buy an expensive meal at the airport. Seats are not that comfortable and if you are unlucky, you have no seats. So it is really nice to stay at airport lounges. Airport lounges offer complimentary food and drinks and that will save you from buying expensive meals. Seats are comfortable compared to boarding gate seats. There are TV, newspaper, and magazines to entertain you. Some have a massage chair, a shower area, and wine and champagne. But the best benefits of staying in the airport lounge is, in case of delayed or canceled flights, you don’t need to stress yourself to rebook it, the staff will do it for you. We experienced that when our Cebu to Manila was delayed. The staff just collected our boarding passes and when she came back, she distributed our new boarding passes. A lot of people think that airport lounges are only for rich people, that’s what I thought too. 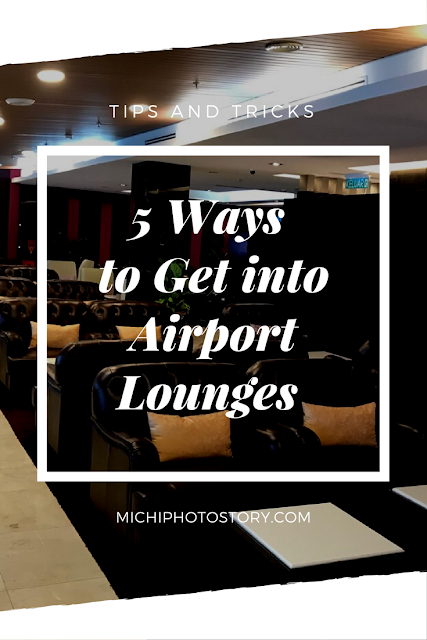 But here are the 5 ways to experience airport lounges even you are not rich. Buying Business Class or First Class Ticket is not cheap so this is not for ordinary people like me. But if you love collecting miles, you can experience a business class ticket or first class ticket too. Whenever we travel, we only buy an economy class ticket so we have no access to airport lounges. But thanks to my expiring miles, we were able to experience our first airport lounge at Mabuhay Lounge at Cebu International Airport. My husband booked the regular ticket only but the staff advised him that my miles are already expired so why not book a Business Class ticket para mamaximize pa yung points kasi yung matitira, mawawala na rin. So my husband booked a Business Class ticket for us using miles. So yes, we were able to stay at the airport lounge for the very first time. If you are a frequent traveler, apply for credit card that allows you to access airport lounges. So even you only have an economy class ticket, you can stay in the lounge. We did this because my husband always travels because of work so we applied for a new credit card. The downside of this is, the annual fee is expensive. But if you are lucky, you can waive the annual fee. Our second experience of airport lounge was last summer, we took Thai Airways airline so the terminal is NAIA 1. We had an economy class ticket, but thanks to our credit card, we were able to get a FREE access to Miascor Lounge. You can bring a companion too. (+1). Whether you are a frequent traveler, a business traveler or not, do not forget to sign up for airline loyalty card. Signing-up is easy, just visit their website, enter your information and that’s it! No payment required, yes, it is totally FREE. Don’t forget to use your membership card every time you book your flight and check-in so your miles will be credited to your account. You can also earn miles even you don’t fly like transferring your credit card points to miles, earn miles from their hotel partners, or shopping. Once you reach the Elite level, you can now access airport lounges. Just check the list of their airport lounges around the world for future references. You can check here the different airport lounges that I have reviewed. If you don’t have a business class ticket, platinum credit card or elite status level, then be a guest. Some airlines allow a companion depending on your ticket, credit card, and membership status. My son was able to access airport lounges because he is our plus one using our credit card and plus one of my husband using Mabuhay Miles Card. My husband was able to experience some airport lounges because he is plus one of his boss. 5. Buy an annual membership, priority pass or day pass for airline lounge access. If you don’t like staying at the boarding gate and if you have an extra budget. You can buy an annual membership or priority pass that allows you to access airport lounges. If you have long a layover, canceled flight or unexpected delay and you want to rest, then avail a day pass. The rate is not cheap, but sometimes you need to pay for comfort. If you want to sleep, check for accommodation inside the airport or near the airport. My husband did that when he has a long layover in Bangkok Thailand. Care to share other ways to experience airport lounges. All along, I thought enjoying airport lounges depends only on the seat one availed, business class, for example. Such a naive reasoning. Nway, now I've learned something new today. Even credit cards can help me land on those lounges. Anyway, who wouldn’t want to experience such luxury?! I love to try the lounge, soon! This is very informative, hope to experience also the Airport Lounge soon. Thanks for this information that we can use in the future. Thanks for the info. I really thought that you had to have a business class or a first class ticket before you can step inside a lounge. Will try to google on what credit cards offer this. Last time L've been at the airport, there was a couch so it made it easier for us to look after our baby then while waiting for our flight. But that was almost 10 years ago. Things might have changed. Would love access to airport lounges, thanks for the tip. sana when we apply for credit card, we have that. For family ba yun if ever? Credit card owner and plus one companion lang siya. Oh, I learned something new! I thought lounges are only for people with business class tickets. Thanks for the information! Its really comfy in airport lounges, got one when we went to Bangkok last year. Cebu Pacific pa lang ang natry namin hahaha. San ba ang airport lounge nila doon? Yay! Thanks for the tip. It might come in handy one day!